Willem Koomans was born on May 8, 1818, in Rotterdam, Holland. His father was Huibert Koomans (1789-1856), who was a son of Nicolaas Koomans and the second of Nicolaas' four wives, Maaijke Maris (1765-1802). 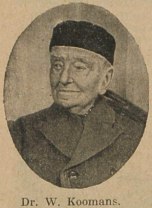 Willem's mother, Adriana Petronella Spanjaart (1784-1875), was to reach the age of 91. After his graduation in Rotterdam, Willem Koomans worked as a doctor in Fijnaart, Brabant, The Netherlands. Next he moved to Leiderdorp, then to Abcoude, both in Holland. He stopped exercising his profession at the age of 71. Willem Koomans married twice. His first wife was Aagje Fontijn (†1849) who originated in Mijdrecht. They had a daughter Adriana Petronella who traveled to Indonesia. Willem's second wife was Alida Jannetta Vermeer from Amsterdam whom he married in 1851. They had additional children before she died in Abcoude in the Spring of 1890. 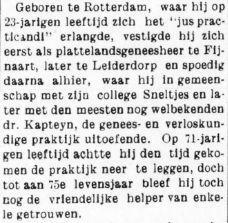 In May 1916 Willem Koomans (98) had been a physician for 75 years. By then he was known as "De Oude Koomans" ("The Old Koomans"). 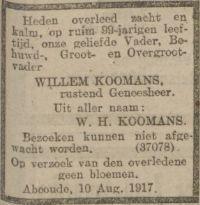 Willem Koomans died on August 10, 1917, in Abcoude-Baambrugge, aged 99 years and 3 months. For more information on this Koomans family see genealogical magazine "De Nederlandse Leeuw", 1936.